Play Review - "California Dreamin"
Unfortunately, the play attempts to compress the complex and far-reaching implications of that dreadful August night in 1969 into something that’s finite and muddled, robbing the event of its power and mystique. Written by Jill Charlotte Thomas and directed by L. Flint Esquerra, the play begins with a eulogy by one of the victims’ fathers, Peter Folger (played by veteran actor John F. Goff), who promptly sets up the play’s theme — that society is dictated by the individual, a fact that was certainly true for the counterculture of late 1960s California. 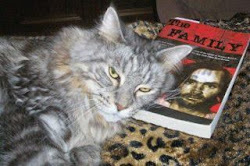 The play makes the case that it wasn’t Charles Manson’s grudge against music producer Terry Melcher that caused him to follow through with his Helter Skelter prediction of an apocalyptic race war on that particular home on Cielo Drive, but rather his being rejected by coffee heiress Abigail Folger, who is the main character of the story. But the play does not clarify why it focuses on this detail specifically. Even if this series of events were true, it’s only one piece in a big puzzle that touched every corner of the counterculture, which California Dreamin’ doesn’t explore in depth. The minimalist set uses newspaper headlines from the era as the backdrop, but it doesn’t go any deeper than that. Authentic costumes only do so much to provide meaning. The murders affected American society, and to simplify these crimes to a story about a disenchanted wealthy liberal trying to figure out her place in the world depreciates the event. More often than it should, the script relies on exposition to explain how a character is feeling. The audience is told how Abigail feels when she talks about wanting to have a fresh start, but the play never shows her emotionally removing herself from the drugs and hedonism of her peers. The script does, however, demonstrate a good deal of research; little touches like Abigail calling her mother at 10 p.m. — the last time anyone heard from her — adds an appreciated level of authenticity to the play. In addition to paying extreme attention to detail, the performances say a lot without anything being said at all. 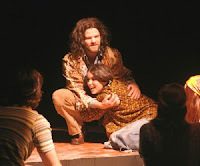 That’s USC alumnus Tyson Turrou’s strength in his portrayal of Charles Manson. There’s a gradual buildup with his insidious insanity, but it never gets to the point of being a caricature. It’s a gripping performance, one in which Turrou’s silence is just as unnerving as his maniacal rants; it proves more interesting than anything else in the play. Ivy Khan does a good job portraying Abigail as a woman at odds with her upbringing and her peers; viewers sympathize with her even though they know her journey will end tragically. Another notable turn is Mark Deliman as Wojciech Frykowski, Abigail’s estranged boyfriend and one of the other victims in the Tate-LaBianca murders. Deliman provides an energetic and, at times, humorous performance. Unfortunately, he barely appears in the second act. This goes back to the main issue with California Dreamin’: It wants to present Abigail’s story as the catalyst of the Tate-LaBianca murders but also presents alternative themes that don’t really go anywhere, all the while masking over details that would’ve been more interesting. Tex Watson, played by Sean Andrews, is turned into a bit character even though he was bloodthirsty in his own right. Abigail and Wojciech’s cultural elitism is prevalent, but it never establishes itself as a consistent theme. The script needs to concentrate on a consistent theme and to take out scenes that rely entirely on exposition. The story of Charles Manson and his family remains a fascinating and complex affair, and it’s a daunting task to try to compress it into a two-act play. California Dreamin’ offers, at times, a compelling insight into the era and the murders, but it’s too unpolished to really bring the event into perspective. This is an interesting review of this play. The premise of the play is that the reason for the Cielo Drive murders is because Abigail rejected Charlie's advances. It says the idea for the play was a good one, but it wasn't developed as much as it could have been. Tex has a minor role. I'm surprised the Folger family hasn't done something to try to stop this play from being performed. I'm assuming they still have a lot of power in California. Maybe they're hoping that if they ignore it, it'll go away? If they tried to stop it, it'd probably bring more attention to it. Well that could be Venus. Ignoring it would probably make more sense. I agree Katie, this is a really well written review. I'd always like to know more background on the play's author - this one and the one who wrote "Mean". I am curious if either were ever blog participants or had any personal connection to the Manson story.